What happens when flipping over a permanent an opponent owns? Darth_Savage While Phyrexian Obliterator might not be hard to work around, the problem is that it isn't the only things I have to work around. While taking a 2 to the face because of Eidolon isn't much, taking 2 after a 10 damage combo due to Monastery Swiftspear Prowess + multiple spell shenanigans and could be the difference between winning or losing. But you are right about Vengeful Pharaoh it's a dead card considering getting 3 of the same mana is hard for a tri color deck. My point for my deck right now is to figure out answers for all the current deck archetypes, without sacrificing card economy. Hence everything being useable from the graveyard. 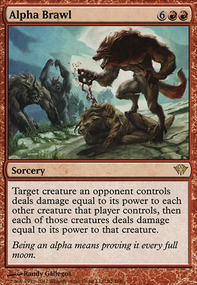 Like for example, against milling Ratchet Bomb for Leyline of the Void removal, or if that fails, just keep casting Nexus of Fate. Against burn decks Sun Droplet to discourage burns until they can "burst me to death," and either damaging myself via Rekindled Flame if I have two sun droplets, prepping Ratchet Bomb for the inevitable Eidolon/Bedlam Reveler, or just gum them for life with Vault Skirge, forcing them to waste a spell on it. Ulamog is there as both a failsafe against dredging myself to death, and a probable win condition. 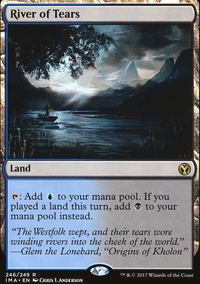 There's also the synergy with Lost Vale and Vesuva, that form of mana ramping is pretty hard to pass up. TheChrisWaits: Oh, man, it’s been amazing (in multiplayer). Give the plants to Player A, swing at Player B (often with a snake they don’t want to block), get Lost Vale untapped?? I usually manage to play, equip, and flip in the same turn. The ramp is great, and the plants are convenient places to stick -1 counters when my opponents don’t have creatures. Out of the top of my head these are the ones I know Gilded Lotus, Doubling Cube, Lost Vale and Primal Wellspring can help aswell. And because you are playing mono-blue you can always have Clever Impersonator to copy any of the artifacts. Instead, you could add much more card draw to get to Fleet Swallower and Fraying Sanity quicker. If you want to keep the unblockable creature aspect (it kind of splits your win conditions, but I see the appeal) you could go up to 4 Curious Obsession and add 4 Chart a Course for great, cheap card draw, plus maybe 1-2 Pull from Tomorrow to use all the Lost Vale mana on. It could be a fun option to have a transformational sideboard into mono-U aggro, as in this list, with 4 Skyship Plunderer, 4 Siren Stormtamer (also a consideration for maindeck as it can protect the Swallower), 4 Unsummon, Cartouche of Knowledge, etc. That way people who bring in anti-mill cards will be stranded with useless cards. A word of advice, though - one advantage of mill strategies is usually that they're creatureless and blank a lot of opposing removal. You'll find this deck is kind of torn between combat damage and milling the library. 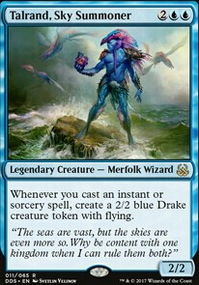 But the two card win in Fraying Sanity + Fish alleviates that somewhat. Shits and gigs you should see if you can work in Dowsing Dagger. With a swarm of bodies you would likely get it to flip into Lost Vale giving you ramp to accelerate your deck or even get it to flip using the flyers. Also when it flips its ready to tap for 3 mana right off the bat so it help with having mana open at times and keeping a solid pace. 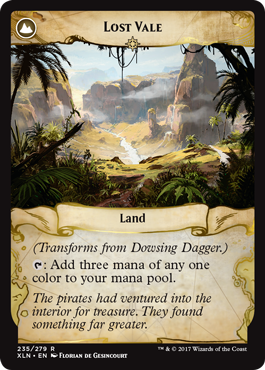 TheDevicer I know that Lost Vale is legal but it doesn't become a land until it is transformed so therefore it wouldn't fit within their playgroup rules, Mishra's Workshop however, does. once again, it doesn't matter to me, I figured I would just throw in my two cents regarding special rules that Ive heard about as my own personal games only follow tournament specific rules and I usually only play modern or pauper. just thought it was an interesting idea that fit within the forum. I am glad that it could spark such conversation! Lost Vale is still an EDH legal land. If not, I can still Mishra's Workshop. The problem with starting with a free land of your choosing is that there are still about a million ways you can abuse it. Even ones that aren't easy to spot. If you really wanted to, you could just cut down on the number of lands in your deck and put in more cantrips to artificially get you through more cards in your deck. This vastly increases a deck's average card quality even if the deck contains mostly the same cards. right, im pretty sure they do it to help each other from blaming the game if they ever get screwed/flooded, so everyone gets to start with a land card on the field. 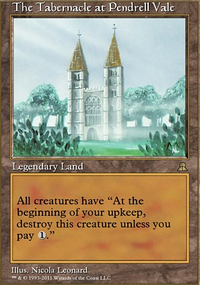 it doesn't have to be basic but it does have to be a land, it cant be something that needs something else to happen to produce mana, so Library of Alexandria would work, while Lost Vale would not. when I originally posted, I thought sol ring was an artifact land and I was mistaken, I don't use sol ring all that often so I hope I may be forgiven this fox paws, faux pas for those that don't listen to chad daniels.